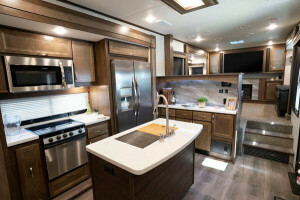 One of the most popular reasons people consider fifth wheels is is the floor space they get, which can then be used to add various features such as bunkhouses, and a kitchen island, among other features. 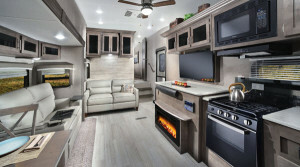 This makes it quite popular for those looking to camp with large families, as bunkhouses will sleep more people and the large space will still create a comfortable and enjoyable living space. 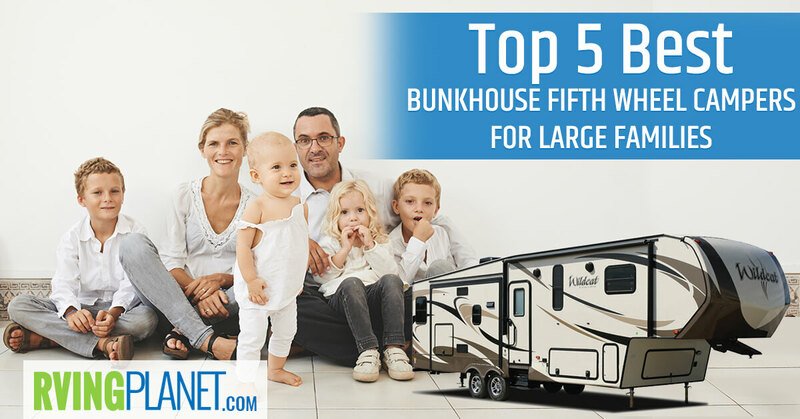 With that in mind, here are the top 5 best bunkhouse fifth wheel campers for large families. What puts an RV on the list: Because you’re looking to camp with many people, it’s best to have the maximum sleeping capacity possible. 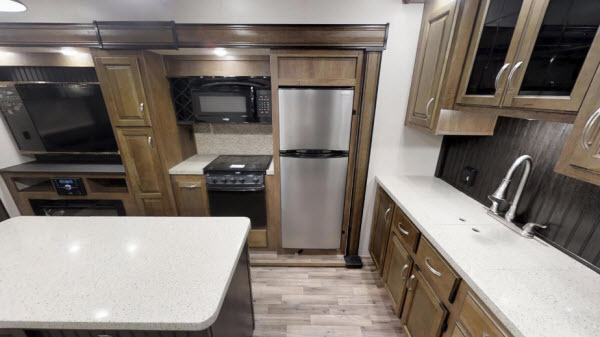 However, apart from that we’ve also chosen RVs with floorplans that are at least 35 feet long to keep everything spacious. 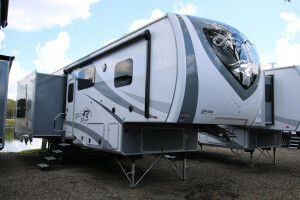 Why we recommend the Forest River Rockwood Ultra Lite fifth wheel: As the name suggests, the Rockwood Ultra-Lite by Forest River RVs starts at a feather light (for a fifth wheel) 7149 lbs, going up to ~9800 lbs. 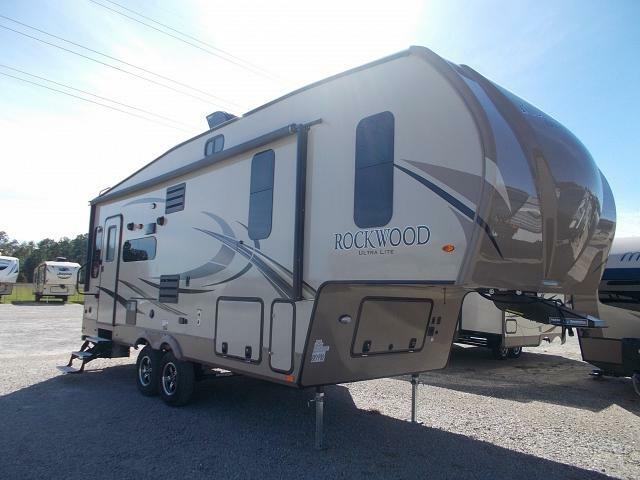 Other floorplans have a sleeping capacity between 7 and 9 people, but we recommend the Rockwood Ultra-Lite 2891BH and Rockwood Ultra-Lite 2892RB particularly because they have bunkhouses and are ~36 feet long. Looking at the features, you’ll find that Forest River paid a lot of attention to detail, which is apparent from interior features such as stalewood interior and deluxe interior window treatment. 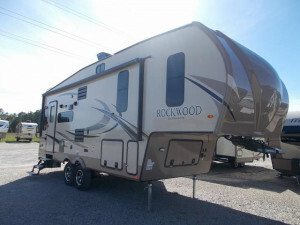 They also have a lot of options to upgrade your RV later down the line, such as a second AC in bedroom, American maple interior and compliance with Canadian RV Standards, which is why we recommend considering the Rockwood Ultra-Lite in your list of bunkhouse fifth wheel campers. Puts the ‘Grand’ in Grandeur! 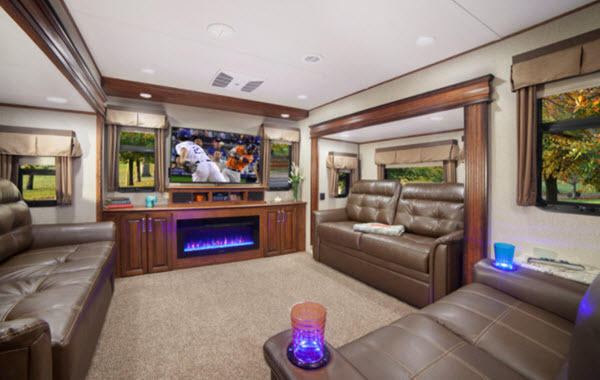 Why we recommend Coachmen Chaparral fifth wheel: The highly acclaimed Coachmen Chaparral lives up to the company name in terms of providing the best luxury possible among many floorplan layouts. 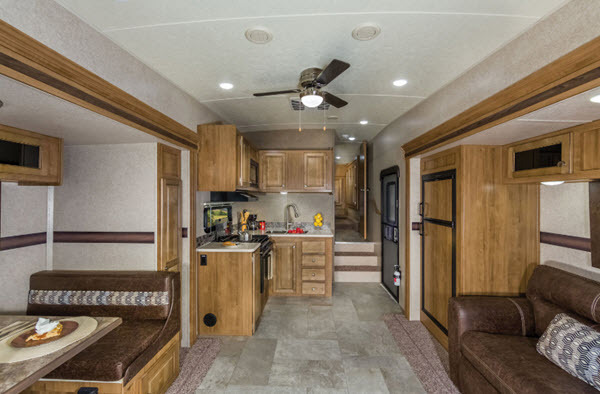 The Chaparral features 6 floorplans that can sleep more than 6 people, and we recommend the Chaparral 360IBL and the Chaparral 373IBMB in particular. As durable and upgradable the Chaparral is on the outside, it’s just as feature-rich on the inside, sporting an Exterior TV mounting bracket, dual USB charging ports, and solid lumber core cabinet tiles. 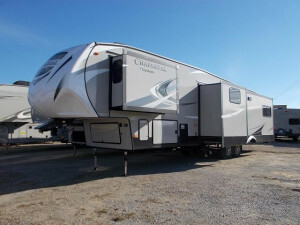 That is just 3 in over 50 features listed on our page, and just as many upgrades available, ranging from interior amenities such as LG solid surface countertops and roller nightshades to exterior ones such as dual pane windows and electronic heated holding tanks, which is why we recommend the Chaparral to anyone looking for bunkhouse fifth wheel campers for large families. 9 different floor plans available! Your Heavy Duty Camping Companion! 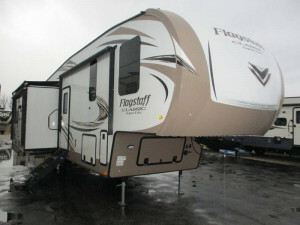 View All Keystone Avalanche Fifth Wheel Floorplans! 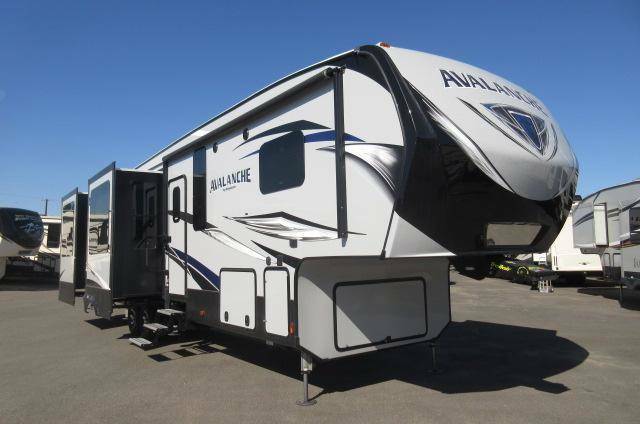 Why we recommend the Keystone Avalanche fifth wheel: As we’ve mentioned in our other posts like the Top 5 Best Fifth Wheel RVs With Slide Outs, the Avalanche has proven itself to be quite versatile, as it’s also fit for people who are looking for fifth wheel RVs for large families. The fact that it features more than 20 overall plans- 3 of which have bunkhouses – is a clear indication that it belongs in this list as well. We recommend taking a look at the following floorplans: Avalanche 395BH and Avalanche 396BH. 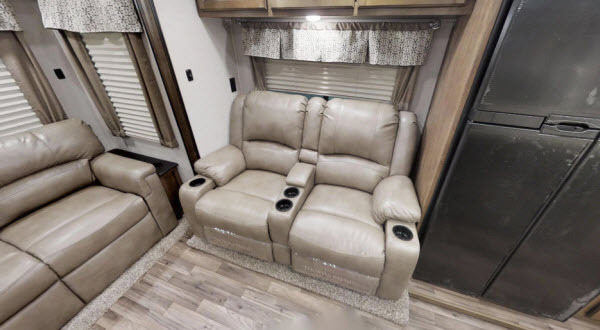 The standard features of the Keystone Avalanche include, but are not limited to extra spacious fully extendable drawers, a quilted bedspread, and power theatre seats with heat and massage. They also have feature packages such as an upgraded appliance package that adds a 30-inch microwave, 18-inch cubic foot refrigerator, etc. These make the Avalanche a top choice for those looking for RVs for large families. 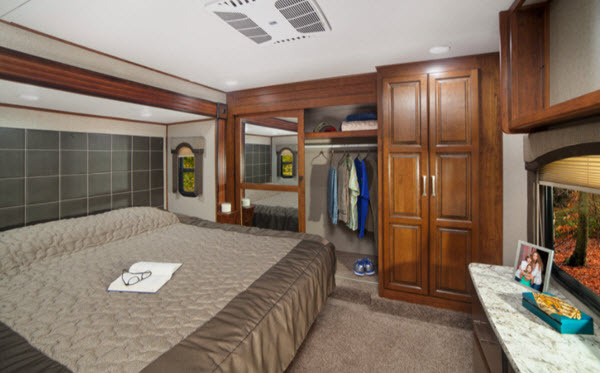 Why we recommend Redwood RV Redwood fifth wheel: The sole fifth wheel from Redwood RV, the Redwood fifth wheel has improved a lot over the years and is versatile enough to serve most use case scenarios. 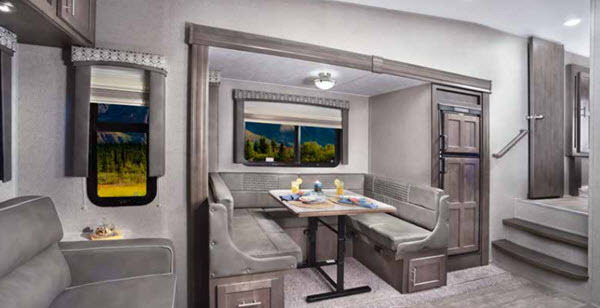 For example, in this case, the Redwood 3941FL and Redwood 394FL Floorplans will serve as good fifth wheel campers for large families. Although these aren’t technically bunkhouse floorplans, they still offer a sleeping capacity of 6 on a few floorplans. 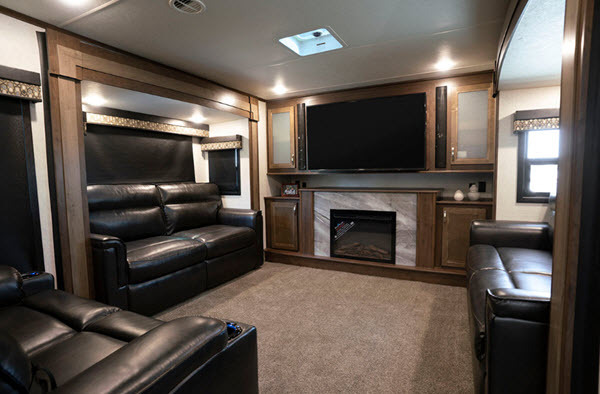 In terms of features, the Redwood RV boasts an aerodynamic front profile, dual pane windows and winterization valves on the outside and USB ports, dual 15,000 BTU AC, automation system and solid hardwood cabinets on the inside. These can be taken up a notch through a myriad of expansions available. Check out the RV page in the link above for more info! Travel In The Lap Of Luxury! View All Highland Ridge Open Range Fifth Wheel Floorplans! 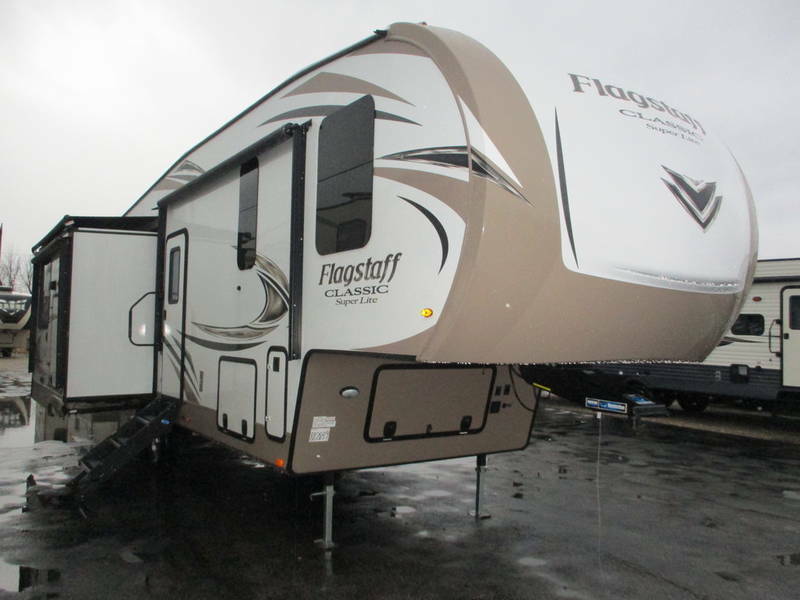 Why we recommend the Highland Ridge Open Range fifth wheel: As Highland Ridge has mentioned on their pages, the Open Range is meant for people who’ve towed campers before and have some experience with RVs, which is why most of their floorplans start with ~10000 lbs, which keeps it durable. Check out the Open Range OF374BHS and Open Range OF427BHS, both of which feature bunkhouses as well! They’ve made the Four Seasons package a mandatory selection when buying the RV, which is perfect for the family that loves to camp all year round! Whether you’re tailgating or getting comfy indoors, it has all the amenities and features you’ll need to make your RVing experience a memorable one. If you need more out of your RV, they have options available, such as an outdoor BBQ grill, dual pane windows and many others! As the proverb goes “The more, the merrier”, camping is a great example of that. 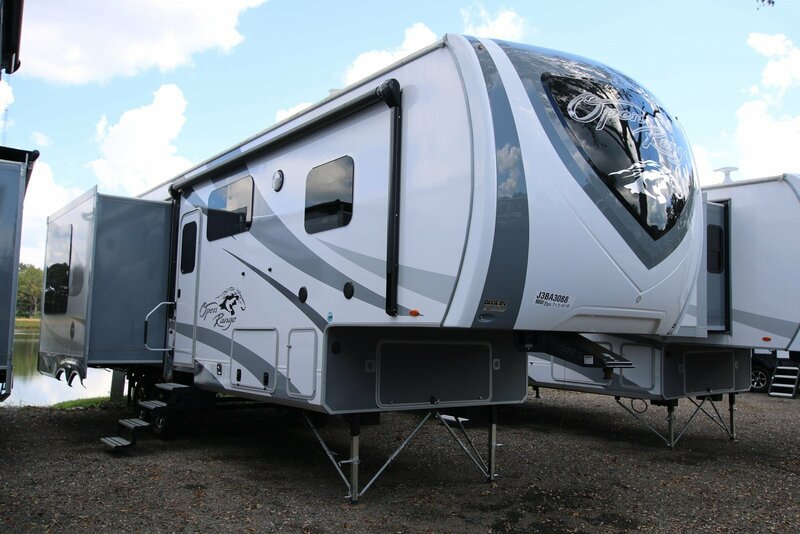 with these fifth wheels, you won’t ever need to worry about space constraints in your camping trip anymore! 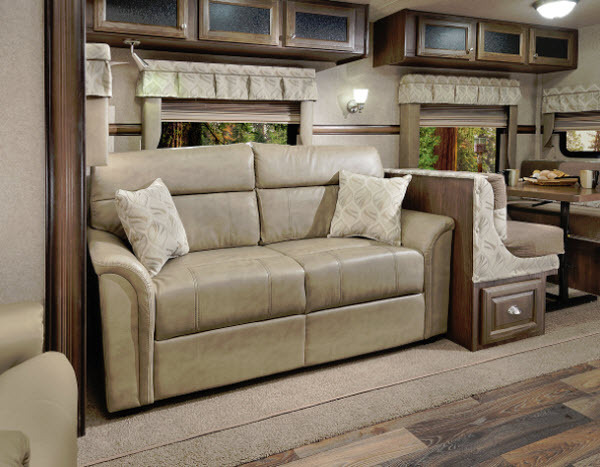 Share with us your favorite bunkhouse fifth wheel campers for large families in the comments below!